Would love some feedback on the boss I made for an upcoming fight. The Orcs, working under the leader of a cult, are transforming their brethren into demon-orc mixtures (Tannaruks from Volo's Guide). 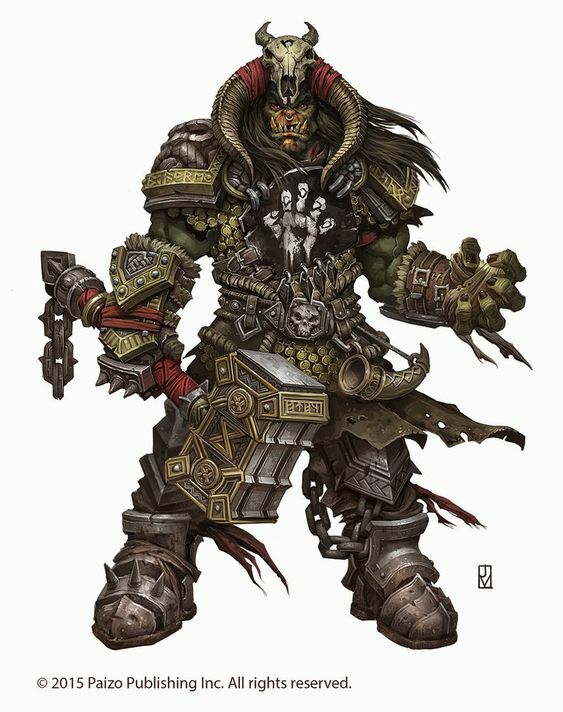 In the first part of the fight the PCs will be facing Shauzug the Bone breaker a warlock/fighter along with some minor orcs. It might look a bit cluttered and it probably is, I hope I can remember all of his abilities. Magic wise he will use Armor of Agathys before combat and then use 1 spell slot for hunger of hadar if he can hit enough PCs with it, saving the last spell slot for a hellish rebuke. The shockwave ability he is using is from a homebrew magic item I made with inspiration from Whelm. I really really like this one. I'm a big fan the staged boss fight. Everything looks good. The only thing that I might change is the frequency that the Phase 1 version can use Dark One's Luck because of how strong it is. I wouldn't want to cut it down to once per rest, but instead give it a cap that makes sense to you. Love the imagery you have here too! Maybe solve two birds with one stone, have some visible aspect of the ritual be 'consumed' to allow the boss to trigger it's dark ones luck power. I don't know what kind of levels your PCs are at but this fight is likely to be really challenging. A way to make this a little bit manageable there should be a way to trigger the second phase other then dropping them to 0. I would tie this to the ritual components listed above (I am imagining sacrifices by the way but you can use whatever you want.) when there is no more of them left stage two begins. This lets the PCs force stage 2 to start by killing the sacrifices while also depriving the boss of one of his powerful abilities. Not super familiar with the edition you are using, so no comment there, but those pictures are super sweet! I did a lot of work with Tannaruk in a play by chat Forgotten Realms game a few years back - thought it might be worth sharing. A demon queen had started a breeding program with some subjugated orc tribes to create 9 Tannaruk champions, each embodying the traits and aspects of a different deity in the orc pantheon. Each was the boss fight of short dungeons that also reflected the personality and dogma of the orc deities. Dark One's Luck is a warlock feat in the PHB (fiend patron) and is once per short/long rest and was meant to be that for him too. But I really love the idea of him taking energy from somewhere to use it, thus they can prevent him from doing it by themselves by stopping the rituals somehow. There are 5 level 7 PCs with one level 5 NPC/DMPC they rescued last session. A Mountain dwarf mystic (UA class) who I'm assuming they will bring along since they thought he was awesome and helpful. 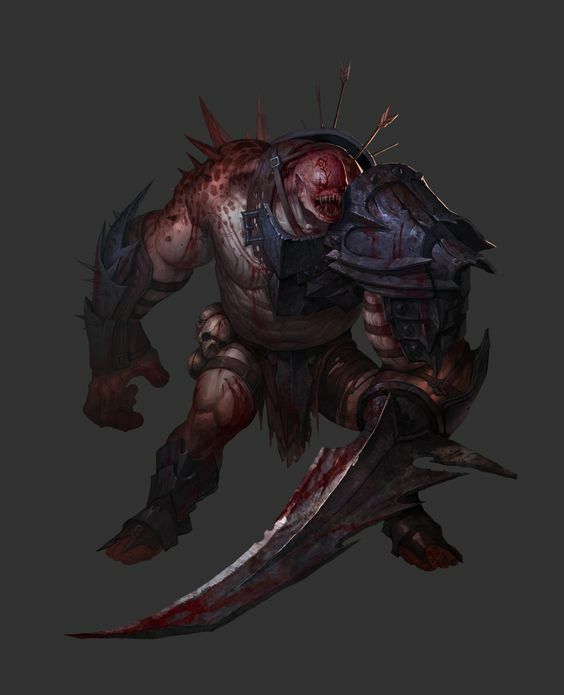 He is not opposed to killing some of the orcs now living in his ancestral city. Having thought about the encounter more here is how it goes in my mind. PCs enter the throne room where Shauzug is and where the rituals are happening. They see him talking to a reoccurring bad guy (Shauzug's "boss") who will not be happy to see them. He will tell Shauzug to kill them while he slips away. Depending on how much alive the PCs are after the fight he may or may not still be there. 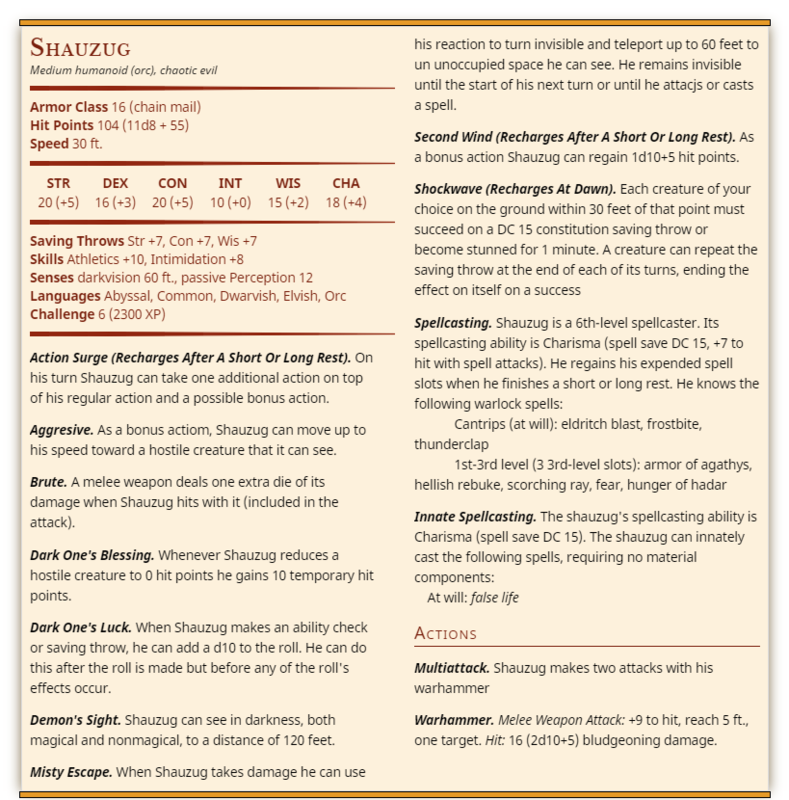 Shauzug "dies" and turns into his demon version killing all the remaining orcs and getting +1 to initiative for everyone still alive (so up to +3). • Shauzug's movement speed is reduced to half (20 feet) and his charge ability changed to anyone within 40 feet. 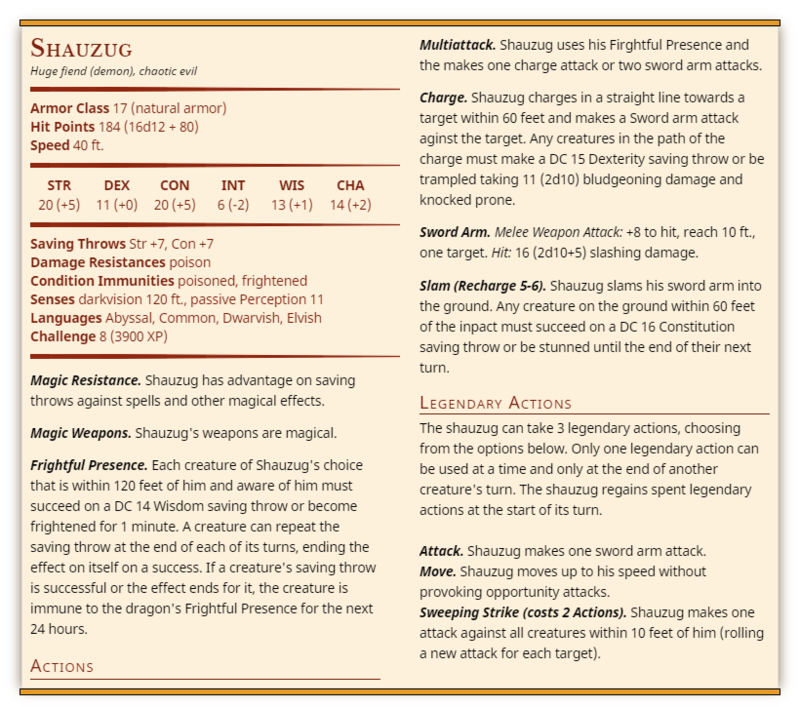 • At the start of his turn Shauzug can spawn 2 hell rifts (up to a maximum of 6) at two points he can see within 120 feet. If there are 6 hell rifts open he can instead close 2 and open them elsewhere. ○ Any creature that starts it turn within 10 feet of the rift must succeed on a DC 14 Dexterity Saving throw. On a failed save the target takes 1d8 fire damage or half as much on a successful save. Thus making him more dangerous the less hp he has, this is a first draft of the new elements of the fight which might be a bit much atm I realize now that I type them out. The room will be quite large so avoiding Hell rifts shouldn't be too hard. Hmm, well assuming that the monsters you presented have an accurate CR, even if they bring the NPC this encounter is going to be nails, maybe unwinnable if they don't. I haven't built monsters at this CR so I'm not sure if they are balanced to that level. At this stage I'm going to assume the monsters you have presented are balanced. Then if I can make a suggestion; you need to be finding ways for the PCs to win, not ways for the foe to be harder... The odds seemed stacked against them, and you should build things into your encounter that will allow clever PCs to beat him. I like the whole stage thing, but can I also suggest reducing the number of stages, my recommendation would be Stsge 1 (Orc) Stage 2a (Demon), Stsge 2b (Demon below half health). Any further divisions will make the fight messy, and it's entirely possible you PCs will skip through a whole stage which will ruin the effect. Thanks that's some great feedback. Hadn't though about that. While I don't think it will be an impossible fight (well maybe with the 3 extra phases) I'll definitely tone it down to 3 phases as you suggested, with ways for them to interact with the battle terrain which can help them. So made some changes based off the feedback I got. Removed Dark One's Luck and replaced it with 3x Legendary Resistance. However, by forcing Shauzug to use all 3 legendary resistances they can force him into phase 2 early. The idea being that he draws power from one of the 10 portals that are near him to stop the magic from taking effect. When Shauzug 2.0 reaches half health phase 3 starts. I'm not really sure what happens here. The phases/buffs I wrote before will probably make him too powerful. But I also want to change up the fight somehow. As per dmgenisisect's advice the players will be able to interact with the portals during the fight to their benefit. For example if they close 3-4 portals before killing Shauzug 1.0 phase 2 will happen. Then for every portal they close there after some debuff will affect Shauzug 2.0 but I'm not sure what exactly. Maybe if they close half the portals (5) they get advantage on Charge saving throws. If they close 7 portals they get advantage on attacks against him. If they close all any hit will be a critical hit. target's speed is halved, and it can't use reactions. On its turn, it can use either an action or a bonus action, not both. Regardless of the creature's abilities or magic items, it can't make more than one melee or ranged attack during its turn. If the creature attempts to cast a spell with a casting time of 1 action, roll a d20. On an 11 or higher, the spell doesn't take effect until the creature's next turn, and the creature must use its action on that turn to complete the spell. If it can't, the spell is wasted. Maybe just keep it simple with if they do 2 portals in a row they gain one level of exhaustion or a combination of both.